The Community Corrections Collaborative Network (CCCN) is a network comprised of the leading associations representing 90,000-plus probation, parole, pretrial, and treatment professionals around the country, including the American Probation and Parole Association (APPA), the Association of Paroling Authorities International (APAI), the Federal Probation and Pretrial Officers Association (FPPOA), the International Community Corrections Association (ICCA), the National Association of Drug Court Professionals (NADCP), the National Association of Pretrial Services Agencies (NAPSA), and the National Association of Probation Executives (NAPE). 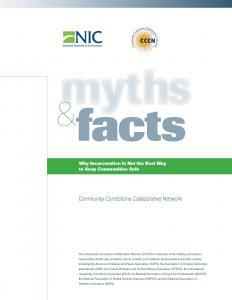 This "Myths & Facts" package includes a one-page list of myths and facts along with a research-based supporting document to show the effectiveness of community corrections. This is not to suggest that prison does not play an important role in the continuum of criminal justice, but that incarceration is not always the best way to keep communities safe, or to break the cycle of criminal behavior, reduce recidivism or to save tax payer dollars. Our network believes that each of the points in the continuum play a vital role in keeping our communities safe and that we must better understand through evidence-based research and science when to use incarceration and when community corrections might be more effective.